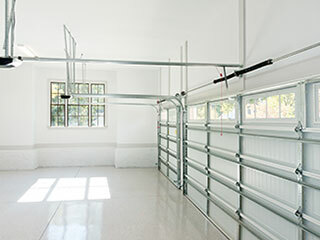 Finding the right garage door opener for your specific needs can be quite a task. There are many options available today, and understanding the benefits and downsides each one presents may not be immediately clear. Don't worry. We're here to help you make sense of everything. Opener models can be divided into three categories based on the type of drive system they employ. Each type has different upsides and downsides. A chain-drive opener, for example, can be very noisy due to the fact that it uses a metal chain as its name suggests. It also requires more maintenance than other types, but it is very reliable and durable, and also, quite affordable. As for the noise output, though, for some people, that can be a major problem. Modern units often incorporate a plastic track, which helps them be much quieter. They’re also usually a bit more expensive, though. If you’re really concerned about noise you may want to invest in a belt-drive opener, which works similarly but uses a reinforced rubber belt instead of a chain. That makes it much quieter, but also more expensive. Then there's a screw drive model, which uses a threaded rod to move the door. It requires very little maintenance and is the fastest of the three types. Its downsides are that it is noisy and that it can be affected by temperature shifts. One big factor when it comes to choosing a new garage door opener is motor design. That means deciding between a DC and an AC motor. In general, DC motors tend to be preferred because they use less electricity and can start and stop much more seamlessly. You’ll also need to consider safety as an important factor. DC motors allow for more speed control, so you can adjust your system to your exact specifications. While an AC motor may be more inexpensive, in the long run, it usually pays off to go with the more reliable option. Modern opener models have all sorts of technological advancements that can greatly boost their safety and security capabilities. There are safety reverse mechanisms, backup battery packs and even WiFi compatibility devices that can be easily operated using your smartphone. Different brands, like Genie and LiftMaster, for example, have special rolling code technology that helps make your opener more burglar-proof. If you need some help finding the right opener for your home, or if you already bought one and just need to have it installed, our experts at Garage Door Repair Deer Park will be happy to help. Keeping your garage door in the best shape ensures that it will be working quickly and reliably for years to come! Our technicians can assure this with a variety of services like maintenance, repairs, and installations. Make sure you can count on your door to open and close when you need it! Schedule an appointment with us online today. Thank you for choosing our company! Feel free to browse our website for more information in the meantime. Our team at Garage Door Repair Deer Park is at your service any time!